The same could be said for cubicles. The 1960’s workspace innovation that took hold in the 1980’s and has been with us ever since has been derided for turning the office environment into a cold, uninviting and impersonal place. Still, what are the options? Sure, windowed offices for each and every employee would be great, but that’s not practical unless your building is as narrow as an Amsterdam row house. Inner offices would need to be created, and those unlucky enough to work in those offices would inevitably feel as though they were working in a cave. Most employees agree. In one office I worked at, employees were given a choice of whether or not to have an inner office or a cubicle with a window. They overwhelming chose having a window. Then there’s that other great innovation, the open plan workspace. Tear down the walls, rip out the cubicles. Everyone sits in a big, airy space at shared tables. There are even couches and comfy chairs to recline on as you discuss the next great idea that will change the world. In fact, the one benefit touted by proponents of the open plan workspace is that it fosters encourages communication and collaboration. They seem to think that if your workplace is one that stifles cooperation, all you have to do is put everyone in a room together, and voila! Problem solved. It’s not that easy. While the work environment can help shape organizational culture, it can’t change it. If you work in a place where no one talks to each other, and new ideas are consistently met with a response of, “That’s not how we do things around here,” making Jack and Jane Coworker face each other day in and day out isn’t going to make an ounce of difference. You don’t need an open plan workspace to have a collaborative culture. I have two people working for me and we all have offices. Yet we have no trouble collaborating. Are doors are generally open, and anyone of us knows that he or she can stop by at any time with questions, concerns or ideas. Changing to an open workspace might help enhance this, but it wouldn’t create a significant improvement. Then there are the drawbacks. Take a look at our situation. We all work in HR. We deal with confidential information and have conversations with people who need to be kept private. An open workspace just wouldn’t do. Nor would it work for most of our organization. We are a financial institution. How would our members feel if information on them and their accounts were left out in the open for anyone to see, the details openly discussed? 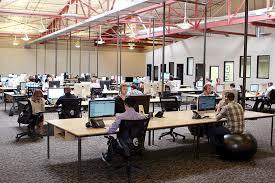 The biggest problem with the open plan workspace, however, is that they lack the one thing they were designed to eliminate – privacy. They are often noisy and the distractions are constant, making it hard to get work done. Study after study has shown that open plan workspaces are less productive than others for this very reason. Getting together to discuss ideas is great, but ideas don’t make money – products do, and to turn an idea into a product, people need quiet places in which to buckle down and work. See much difference? Neither do I (Except for that guy sitting on a ball. No worker who survived the Great Depression and the Second World War would sit on a piece of inflated rubber when there are perfectly good chairs around). So why the trend to open plan workspaces? First, there’s the follow the leader effect. The reasoning goes like this: Google and Facebook have open plan workspaces. Google and Facebook are successful. If we adopt an open plan workspace, we’ll be successful too. The proponents of this logic fail to realize that it’s the culture at these companies that made them what they are, not their workspaces. The workspaces weren’t born of nothing, but evolved with the organization. If anything, the workspace is a product of the culture, not the other way around. And then there’s this, the real attraction to open plans for most companies – they are cheaper and easier. Those metal and cloth cubicles cost a lot of money, sometimes more than building true offices. Not only that, but you don’t have to deal with the headache of where to seat people. So why go to all that bother, when you can just stop by at Ikea, pick up a bunch of tables and chairs and be done with it? Fortunately, despite what I said earlier about cubicles being the better option, A workspace does not have to be an either/or choice. The best workspaces I’ve seen mix and match open spaces with cubicles, allowing you to get together to collaborate, but get some privacy to get your personal work done. 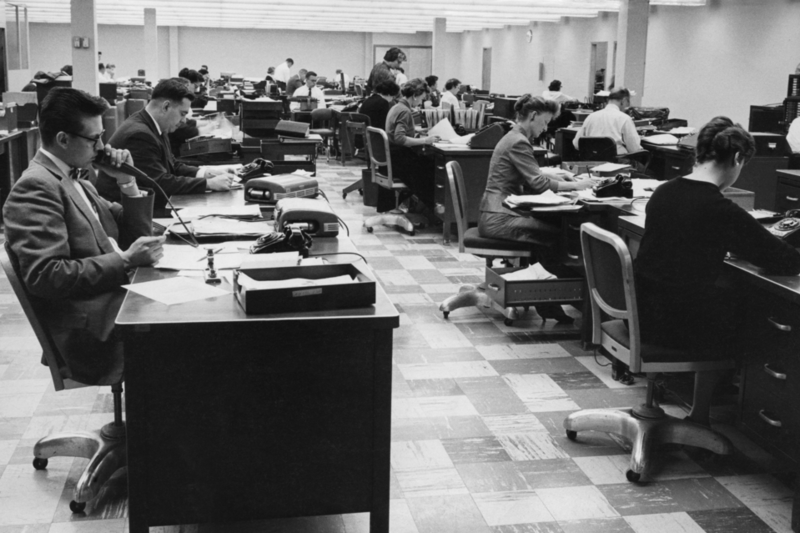 If you are still on going back in time with an open plan workspace, Do me a favor and go all the way – add a few ash trays and some rotary phones? This entry was posted in It's a Mad, Mad, Mad, Mad Worplace, What's New and tagged cubicles, office design, open plan workspace, work design.